Solar Thermal Water Heating is a simple, reliable, and cost-effective technology that harnesses the sun's energy to provide hot water to your house. 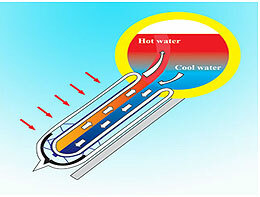 With the power of Sun the absorber surface gets heated up, warming the water flowing through the tubes attached to it. The heated water is transferred to the insulated storage tank. The Cold water flows from the bottom of the storage tank to the collector. From here, the heated water rises to the top of the storage tank. Will I get hot water in the morning? Yes. The water would be available every morning. The water you get is the one which was heated by solar water heater previous day. The PUF insulation material used in the solar water heater keeps water hot for use next morning. Will I get hot water in low sunlight conditions? Our Solar water heater comes with solar selective coating which absorbs visible as well as infrared radiation even in cloudy or diffuse sunlight which gives hot / warm water in low sunlight days also. 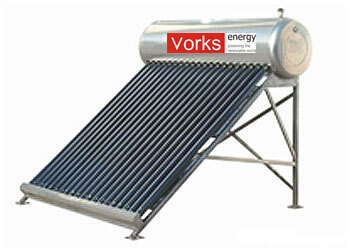 What is the expected life of Vorks Solar heater? Since our solar water heater is Evacuated Tube Collector (ETC) based heating system, life expectancy is more than 10 years. No. When compared to other heaters, the cost of Vorks Solar water heater seem high at first sight but comparing the running cost of each you will have better projection of its economy.